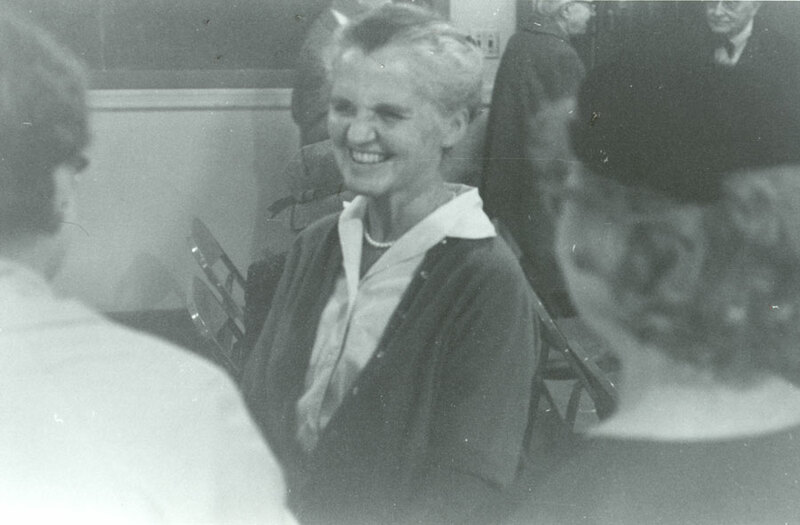 While Ava Helen was busy volunteering for radical women’s groups in the 1940s and 1950s, she became a participant in another revolutionary group: the Atomic Scientists’ Movement. The bombing of Japan at the end of World War II left American physicists with very mixed feelings. Initially many American physicists were simply relieved to no longer be at war. I.I. Rabi, a scientist who served as the director of the defensive radar developments at MIT and worked on the Manhattan Project, remarked that he was “frankly pleased, terrified, and to an even greater extent embarrassed when contemplating the results of [my] wartime efforts.” A survey of physicists in September 1945 revealed that 66.5% of physicists approved of the government’s decision to bomb Japan. The atomic bombings of Hiroshima and Nagasaki in August 1945 provided a grim counterpoint to the elation with which Manhattan Project scientists had celebrated the Trinty Test a month earlier. Even as the war ended, scientists began to imagine the terrifying possibilities of the next great war. As American soldiers returned from the battlefront, physicists returned to their pre-war duties within research laboratories. It took months for many of these physicists to process the full implications of the Manhattan Project. Feelings of guilt, anxiety, and fear began to ferment within the minds of American physicists. “As more information began to accrue about the real-world effects of the bomb, including the new threat of widespread radiation poisoning,” historian Thomas Hager summarized in his Pauling biography Force of Nature, “a sense of guilt spread across the scientific community – especially that portion involved in designing and building new weapons.” As the radioactive fallout of Hiroshima settled across the Pacific Ocean, American scientists started to take sides in the new Cold War. A small group of plucky, prominent physicists, including Eugene Rabinowitch, H.H. Goldsmith, Harold C. Urey, Leo Szilard and Katherine Way advocated for international nuclear disarmament. 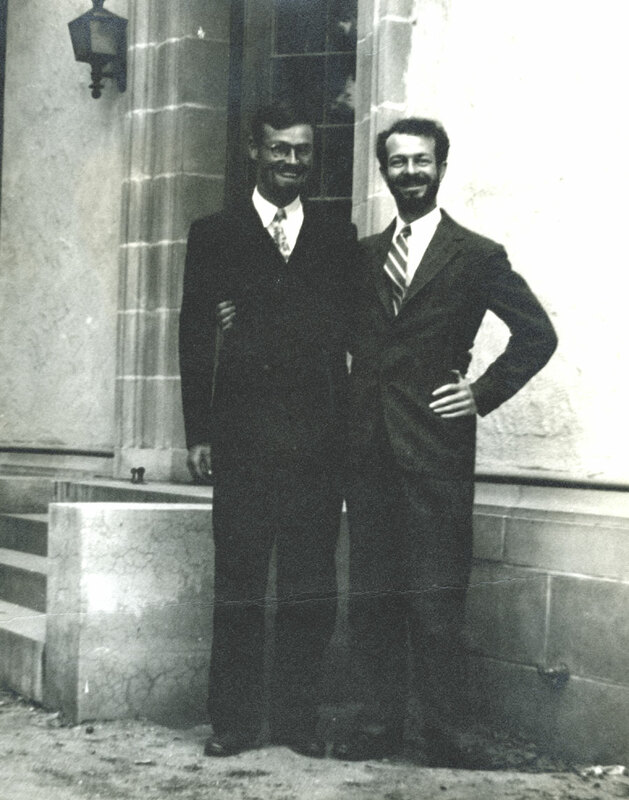 They organized the Federation of Atomic Scientists (FAS) in October 1945. The FAS united small pockets of concerned scientists, such as the Oak Ridge Engineers and Scientists and the Association of Los Alamos. The FAS intended to lead inquiries into the implications of atomic energy, shape national and international atomic policy, and raise national awareness of the potential dangers of nuclear energy. But members of FAS had an even larger ambition in mind. They sought to redefine scientists as “part of a larger public, within which [scientists] participated as equals, but offered their expertise for the purpose of information, consideration, and criticism.” Previously, scientists were isolated in laboratories and separated from the cultural implications of their technology. The FAS sought to forge a partnership between scientists and the general public. 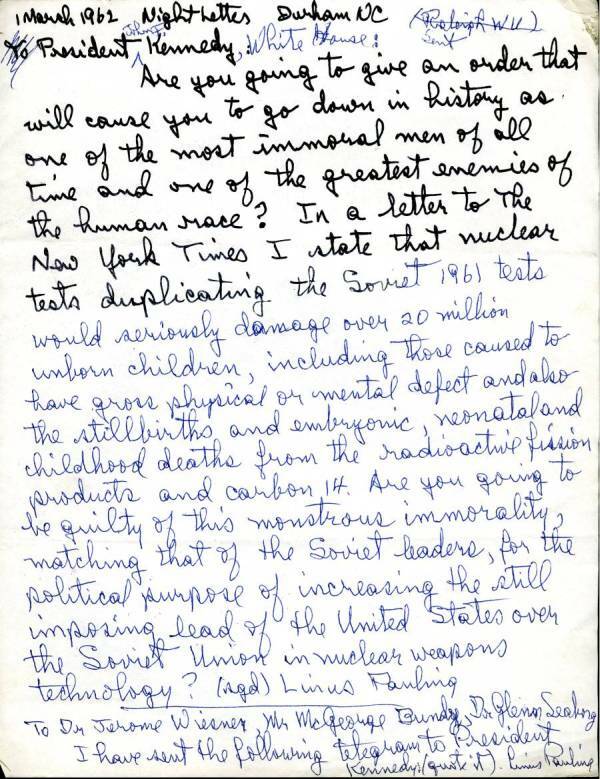 Scientists, they concluded, neither “could be or should be separated from the social and political ramifications of technological innovation.” And, by continuation, an informed public would be an empowered public that could wisely navigate through the emotional rhetoric that shaped atomic legislation. The FAS facilitated the conciliation between scientists and the public through a strong public education campaign. The National Committee on Atomic Information, a subset of FAS that organized in November 1945, was the public face of the Atomic Scientists movement. The NCAI reached out to “labor movements, educational organizations, religious groups, and professional associations for cooperation and assistance in appealing to the public.” It connected local scientists at speaking engagements with youth groups, women’s clubs, and religious centers. The NCAI sponsored educational science fairs and distributed study kits, educational films, pamphlets, and moralistic plays. Atomic Information, the public mouthpiece for NCAI and FAS, was first printed in March 1945 and was sent out to 10 million addresses. It presented serious scientific articles alongside quirky cartoons and enthusiastic political commentary. 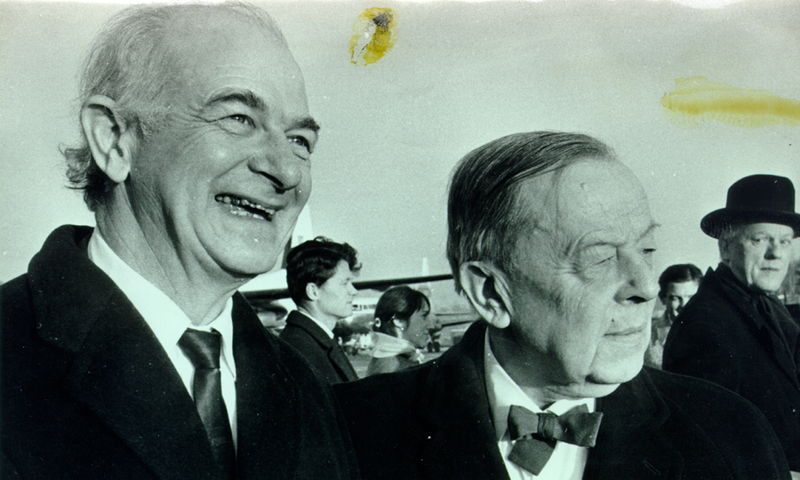 Charles Coryell and Linus Pauling, 1935. The Paulings quickly became active participants of the Atomic Scientists Movement. Many of the scientists involved in the movement were good friends of the Paulings. Charles Coryell, one of the young men who founded FAS, was one of Linus’ former students. The Federation of Atomic Scientists recruited Linus as a high profile public speaker as it lobbied Congress for a civilian Atomic Energy Commission in the spring of 1946. That same spring, the director of the NCAI, Daniel Melcher, approached Albert Einstein with the idea of creating a fundraising society, chaired by scientific stars like Einstein, that would raise monetary support for the FAS directly from the American public. This society, the Emergency Committee of Atomic Scientists, became incorporated in October of 1946. 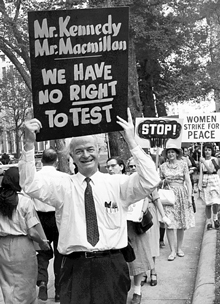 Linus Pauling eagerly accepted their invitation to join and raised money for the FAS’ public education campaign. 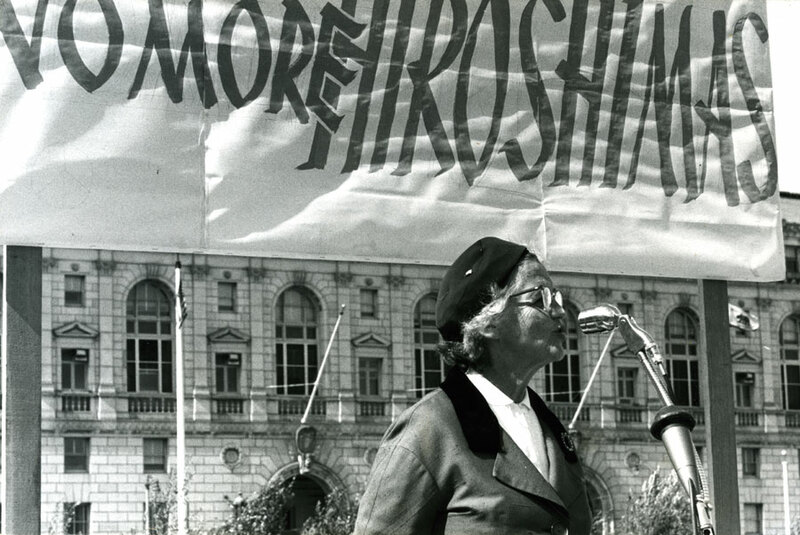 The FAS’ successful public outreach campaign cultivated a national interest in the implications of atomic energy. The demand for scientists who could speak on atomic matters steadily increased. Ava accompanied Pauling to almost all of his talks, sat in the front row of the audience, and listened carefully to his delivery. She also kept an eye on the room, saw what worked and what did not, and afterward critiqued his performance. The Paulings also read up on the politics of atomic energy until Linus felt that he could confidently “speak on his own authority.” Under Ava’s watchful eye, Linus transformed from a college professor into a public scientist. Ava Helen Pauling speaking at Women Strike for Peace rally, San Francisco, August 1961. But Ava Helen wasn’t going to let Linus have all of the fun. After years of working behind the scenes, Ava Helen finally began to give public speeches in 1957. Initially, Ava Helen gave speeches centering on the Paulings’ international travels. By the early 1960s, Ava Helen was regularly speaking to women’s clubs and religious groups on topics concerning peace, science, and women’s rights. Although Ava Helen didn’t receive the same high billing as Linus, she easily reached an audience that the FAS was eager to connect to: women. American women had become fierce cold warriors after World War II. As wives and mothers, they were expected to protect their own families and communities. The moral responsibilities of women grew during the 1960s to extend outside the home. Women needed to defend their community against any environmental hazards, like nuclear fallout or toxic pesticides. A 1962 poster advertising the group Women for Peace capitalized on these concerns, noting that fallout caused cancer in children and took money away from important social programs. A basic understanding of science became an integral part of a woman’s post-college education. While she was initially booked for public events as “Mrs. 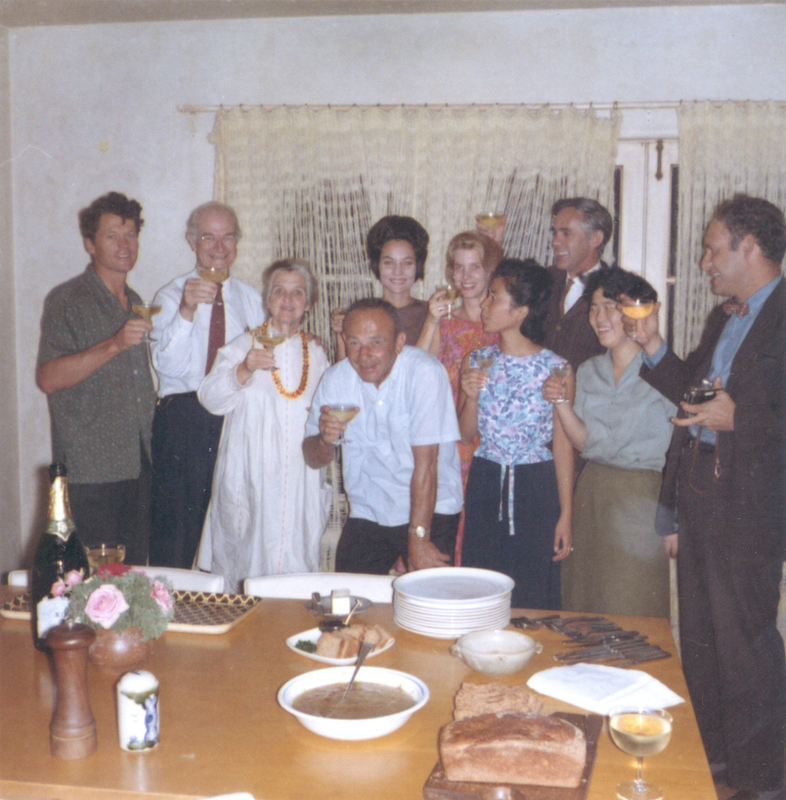 Linus Pauling,” Ava Helen quickly developed her own persona as a public speaker. She spoke almost exclusively to middle class and educated women; commonly appearing at a luncheon for faculty wives or a tea for WILPF members. Ava Helen demurely called herself an “educated layman.” But this was certainly an understatement; Ava Helen had kept pace with her husband for many years. She enjoyed attending scientific conferences with her husband and learning about new scientific studies. Yet the lecture programs written for Ava Helen’s speeches only noted her background in chemistry, stressing her experience in laboratories. At first, it seems odd that Ava Helen would choose to downplay her education and highlight her practical experience. But most of the women who comprised her audience wouldn’t have had a formal scientific education. Some of them might have worked in scientific laboratories during World War II. Many had read articles about the importance of women in laboratories from popular magazine articles. By focusing on her practical experience, Ava Helen carefully aligned herself with her audience. In 1926, a young Ava Helen Pauling arrived in Munich, Germany, ready for academic adventure. 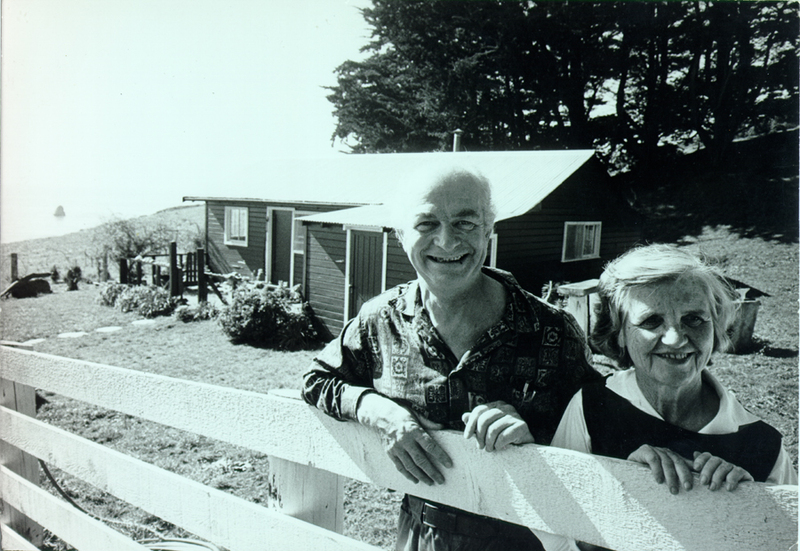 Her husband, Linus Pauling had received a Guggenheim fellowship to study atomic structure and quantum theories at the University of Munich. While Linus learned quantum mechanics from scientific giants like Sommerfeld and Schroedinger, Ava Helen explored German intellectual life. As she recalled later, it was a time of “great excitement and intellectual growth.” Ava Helen visited art museums and natural history collections. She attended scientific lectures in physics and chemistry. She edited Linus’ physics papers and chatted with brilliant scientists. And as Linus learned how to be a scientist, Ava Helen struggled to comprehend her new role as the wife of a scientist. 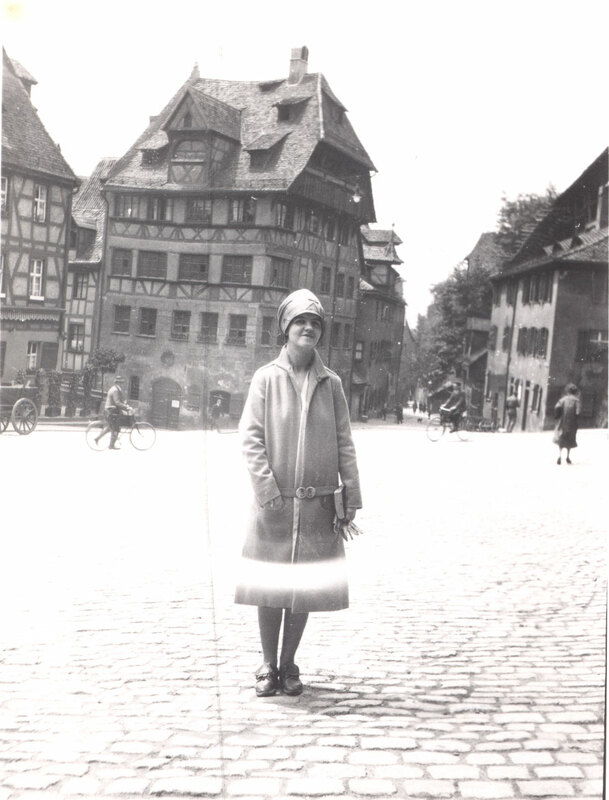 Ava Helen in Germany, 1927. Early on their relationship, Linus and Ava had been united by their passion for chemistry. They collaborated on lab experiments, scientific calculations, and chemical models. But, since the birth of their son, Linus Jr., in 1925, Ava Helen had become increasingly separated from her husband and the world of science. On an even larger scale, Ava Helen wondered about her own role in the future of humankind. Her personal journal from her year abroad in Germany reveals her search for a clear identity. Ava Helen’s journal is filled with chemical notations and elemental symbols. It also includes reviews of anthropology and sociology texts, books that Ava Helen read to understand the roles of women in other cultures. Ava Helen even mentions herself as a Professor among her addresses of other professors at the University of Munich. But ultimately, Ava Helen reached a startlingly pessimistic conclusion on her role in society. “If a woman thinks honestly and clearly,” Ava Helen writes in her journal, “she must soon reach the conclusion that, no matter what life work she chooses, it could be better done by a man.” Ava Helen decided to let go of her own interests in science and to focus her energies on furthering Linus’ career. Upon their return to Cal Tech in 1928, Ava Helen settled into her new role as the professor’s wife, hostess, and caretaker. She was not alone in her conclusions. 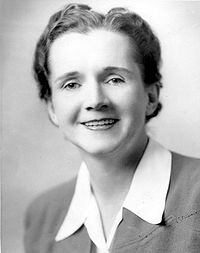 Many of her contemporaries, American women interested in science in the early 20th century, also decided to bow out of scientific communities. The American women who did try to pursue scientific education and careers found themselves pigeonholed as research assistants and secretaries. But following the end of World War II, many Americans began to reconsider their previously accepted social roles. Many began to search for new identities. 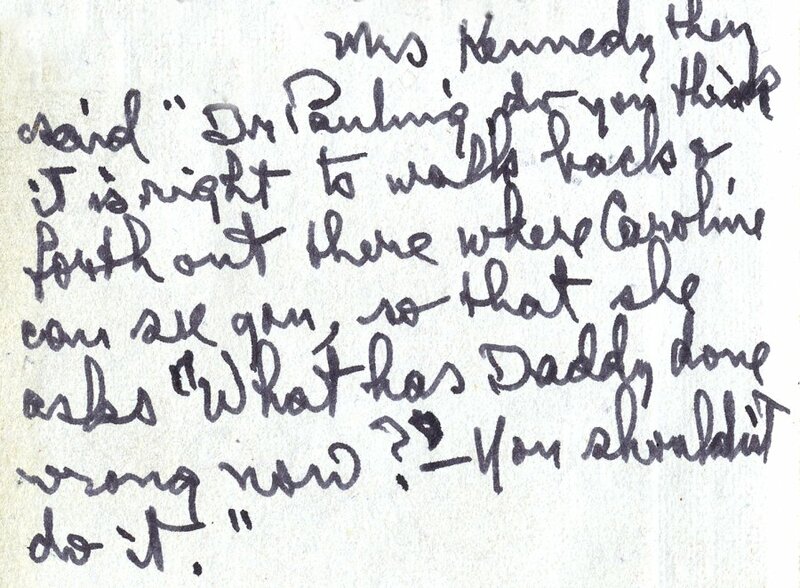 For Ava Helen Pauling, the end of the war provided the catalyst for her change in identity. She, along with thousands of other women, began to advocate for a respected role within American society. By the 1960s, these American women organized political groups and formed the foundations of the modern feminist movement. The end of World War II also prompted members of another major community to realize that they wanted to change their public image. During the early 20th century, physicists had isolated themselves from the American public. Following WWII, these atomic scientists began to envision a new role for themselves as socially responsible, public educators. They began a crusade to educate and reconnect with average Americans. Standing at the crossroads of the feminist and the atomic scientist movements, Ava Helen Pauling joined both groups. At the dawn of the America’s Atomic Age, Ava Helen Pauling recast herself as a feminist activist and an advocate for scientific education. By the 1950s, twenty years after her trip to Germany, Ava Helen was no longer an eager student, but a harried housewife and a mother of four children. Her husband Linus, as she would sadly explain in interviews, needed to devote himself to science. So it was up to Ava Helen to take care of common household tasks. Ava spent her time thinking about what she called “trivial things,” like cleaning dishes, taking their children to the dentist, and paying bills. The Pauling family calendar from 1946 reveals Ava Helen’s busy life: during that year, she spent most of her time taking care of the four children, preparing Linus for business trips, and hosting visiting professors. By the 1950s, Linus had become a respected professor and had received a Nobel for his work in Chemistry. But Linus was well aware of Ava’s sacrifice. He later credited his scientific achievements to his wife, remarking, “I am not smarter than other [scientists]…[but Ava] handled the problems and stresses associated with family, leaving me free to devote all my time to working on the problems I wanted to work on.” While Ava Helen was pleased with her husband’s success, she was frustrated with her own progress in life. The pressure of managing an entire household weighed heavily on her. 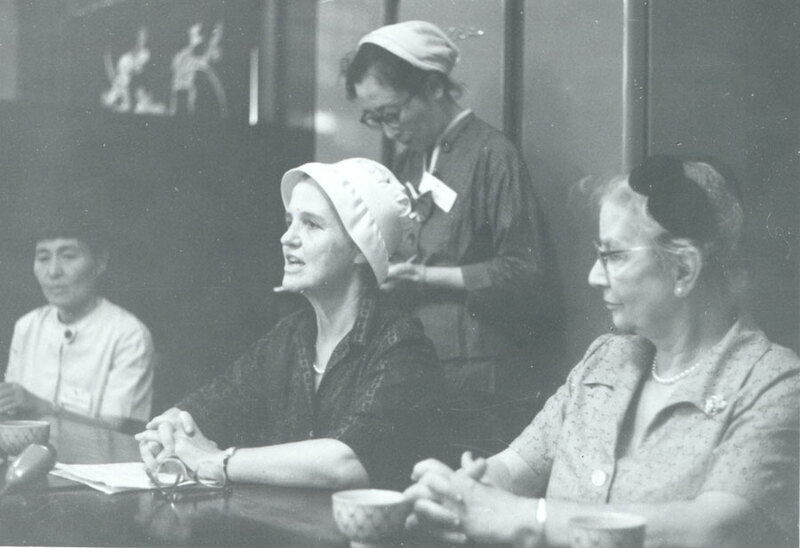 Ava Helen at a meeting of women in Japan, 1955. Ava Helen continued her family’s legacy and became involved in several progressive organizations focused on social change. During World War II, Ava Helen had become an active member of the ACLU and protested the discrimination of Japanese Americans. She also became a member of Union Now, an organization that advocated world government. Ava Helen also grew increasingly aware of women’s issues around this time. “I [felt that] I needed to learn more about women…” she recalled years later, “I became interested to see what other women were doing.” In 1956, Ava Helen also joined another major women’s organization, the Women’s International League for Peace and Freedom. Women’s International League for Peace and Freedom (WILPF) was an organization started by Jane Addams in 1915. 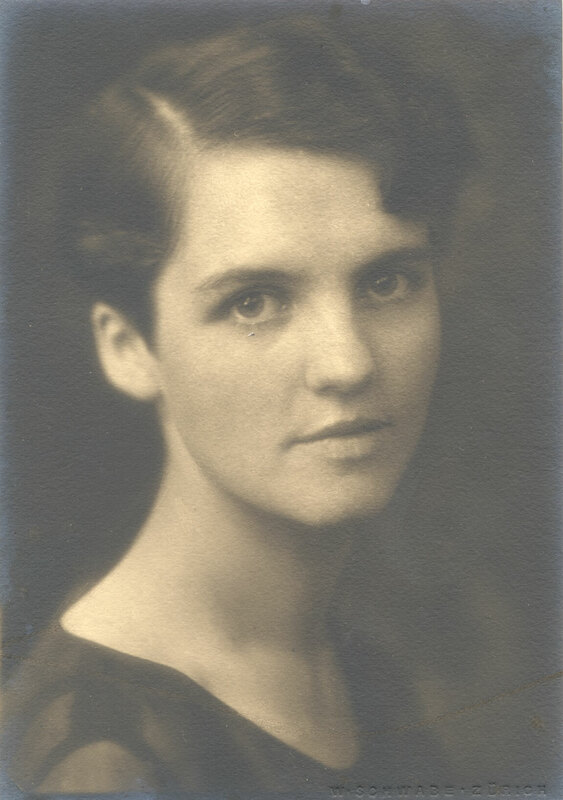 By the 1950s, WILPF’s goals included: “the education of youth for peace, measures to remove the economic causes of war; and total and universal disarmament.” In the 1960s, Ava Helen would become a founding member of WILPF’s two offshoots: Women Strike for Peace (WSP) and Women Act for Disarmament (WAD). Women’s organizations like WILPF, WSP, and WAD served important functions for women’s rights in the years before the 1960s. As Susan M. Hartmann explains in her book From Margin to Mainstream, these groups “not only motivated and trained women for public office, they also operated as pressure groups. In the post-suffrage era, substantial numbers of women organized to shape public opinion, mobilize voters behind female defined issues, and exert direct pressure on legislatures and administrators.” The women who worked within women’s organizations in the 1940s and 1950s gained the skills necessary to become the feminist leaders of the 1960s. Ava Helen at the WILPF national meeting, Washington D.C., June 1960. 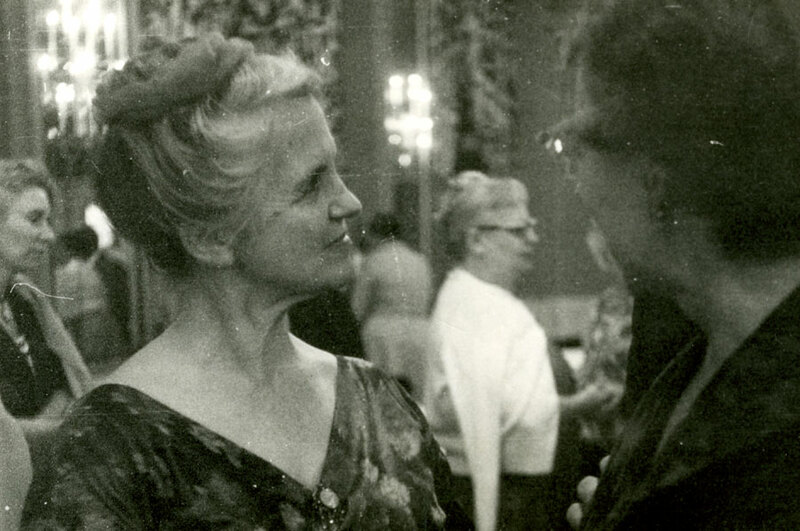 Indeed, while working for WILPF, Ava Helen fully immersed herself in the feminist movement. She believed that world peace would be achieved by the total equality of men and women. Ava Helen had read some early works of feminism published in the 1940s, like Mary Inman’s In Women’s Defense. When Betty Friedan published The Feminine Mystique in 1963, Ava Helen bought the book on the first printing run. 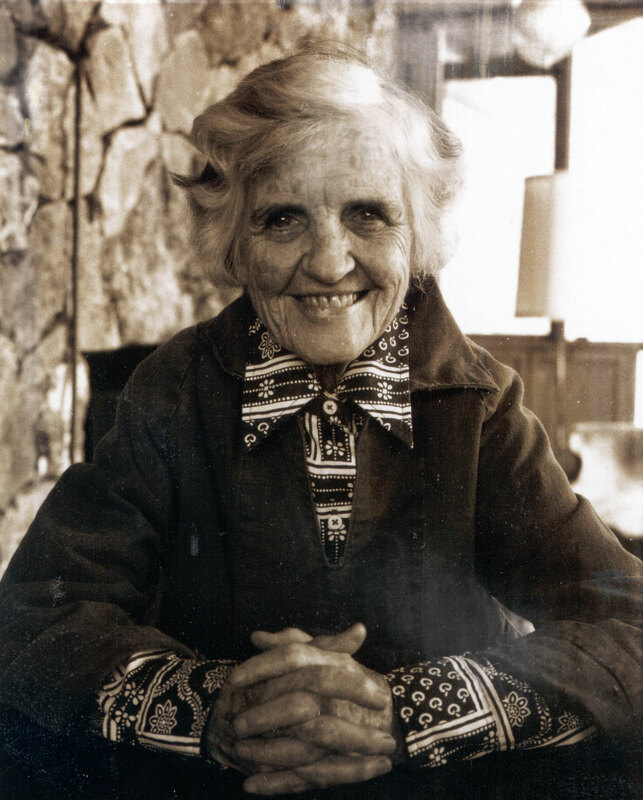 She instantly connected to Friedan’s theme and publicly hailed the book as “excellent and provocative.” Like Friedan, Ava Helen believed that a woman did a disservice “to herself and to society and to her children by electing to remain in the home and devot[ing] her full energies to her home.” By working with organizations like WILPF, WSP, and WAD, Ava Helen felt that she was finally serving a larger role in her society. 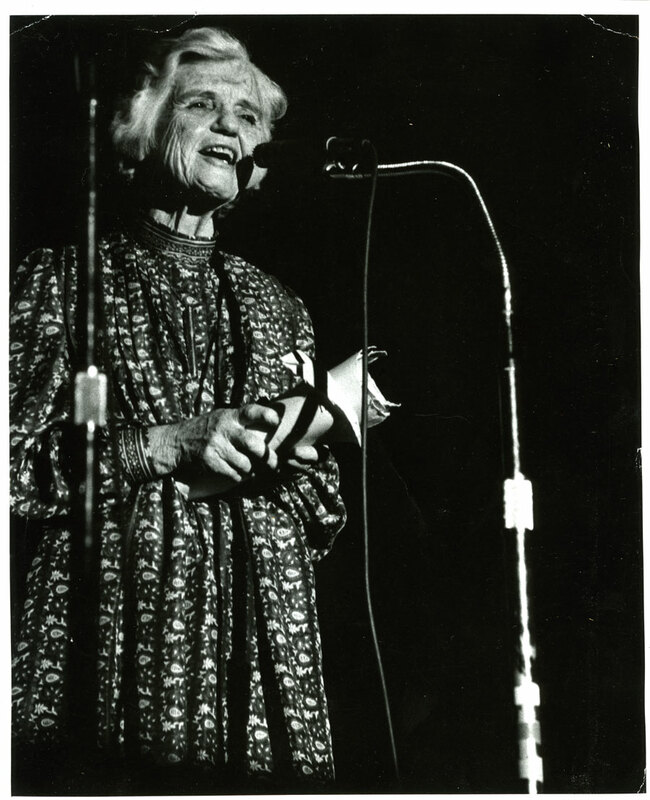 Ava Helen honed her skills as a public speaker and activist while she organized WILPF events. In 1959, she had been elected the vice president of the American Chapter of WILPF. Ava Helen eagerly organized national conferences. She even helped coordinate the 1964 International Women’s Strike for Peace Rally at the Hague. In 1961, she and Linus worked together to organize a major conference between scientists, writers, and peace activists in Oslo, Norway. Ava Helen emerged from the shadow of her famous husband, as an important public figure.